In June 2016 a majority of deputies voted for the dissolution of the Croatian Parliament, which became effective July 15, 2016. This early dissolution came only a few months after the last parliamentary elections in November 2015. Unfortunately this election did not result in a clear majority for any of the two main parties (the nationalist, center-right HDZ and the center-left SDP). It was however expected that the then-ruling SDP and its Prime Minister Zoran Milanović would form the new government with the support of the newly established, and widely seen as independent, platform MOST. Yet, in a very surprising move, MOST formed a coalition government with the conservative HDZ. This coalition forced the SDP into opposition and was led by a widely unknown new Prime Minister Tihomir Orešković (Vlahovic 2016). The brief period of government until the dissolution of parliament in June was strongly influenced by the growing tensions between the main political representatives of MOST and HDZ, in particular between the MOST leadership and Tomislav Karamarko (then deputy prime minister and party leader of HDZ). MOST accused Karamarko of conflicts of interest by engaging into a public discussion of the national oil company (see for more detailed information Matijaca 2016). Although it is widely reported that the calls of MOST for the resignation of Karamarko and thus the enduring conflict between MOST and HDZ were the trigger for the vote of no-confidence by HDZ deputies, the 5-months coalition government was also characterized by a growing gap between the policy interests of these two parties. What followed was an astounding act of self-destruction, the vote of no confidence initiated by the deputies of HDZ against their own prime minister. After the vote of no confidence was initiated and confirmed by a parliamentary majority President Grabar-Kitarović followed the provisions of Art. 104 of the constitution and dissolved the national assembly. After the devastating experience of the 5 months government and the inability to form a new governmental majority the chair of the HDZ, Karamarko, resigned. Karamarko pursued a highly nationalist agenda and was partly responsible for increasing nationalist sentiments in the public discourse. He was succeeded by Andrej Plenković. Plenković pursues a very different agenda and started with the promise to push the HDZ closer to the middle. He was elected by the HDZ party members in July 2016 “in a sign it [HDZ] was distancing itself from ultra-conservative elements” (Byrne 2016). With the new party head of the HDZ, the duel between the two leading politicians – Plenković for the HDZ and Zoran Milanović for the SDP – started. And the campaign was right from the start personalized and at times left decency far behind. It became obvious that Milanović was prepared to fight against Karamarko but failed to find a proper way to campaign against Plenković. Personal insults were in particular made by Milanović against Plenković, one perceived offense against Plenković’s parents was widely reported. However, these personal attacks did not help Milanović, it rather helped HDZ in two ways: First, Plenković behaved differently in public and was thus inspiring more confidence and second, MOST aligned with HDZ in their pursuit to change the political culture in the country (Milekic 2016). The election was held on September 11, and a total of 151 members of parliament were elected. According to the information provided by the Sabor (the Croatian Parliament) 140 members of parliament are elected in 10 territorial constituencies in Croatia. 3 are elected by Croatian citizens living abroad. 8 seats are reserved for ethnic minorities (Parliament of Croatia 2016). The deputies are elected in a proportional representation system and similar to other countries a 5 % electoral threshold is necessary. The earlier mentioned rival parties, HDZ and SDP, each formed a party list. HDZ with Andrej Plenković run on the list called “Patriotic Coalition” and Zoran Milanović and the SDP on the list called “Croatia is Growing” (in cooperation with HNS, HSS and HSU). In addition MOST and a number of other parties and coalitions stood for election. Within this short campaign period between July and September, opinion polls frequently showed a tie between the two main competing parties. Yet, the official election results were different and presented a surprisingly clear winner, Andrej Plenkovic and the HDZ. Upon the report of the State Election Commission HDZ won 61 seats and the People’s Coalition only 54 seats (Milekic 2016a). The most likely option for a coalition will be once again HDZ with MOST – similar to the unsuccessful attempt earlier this year. Petrov, the leader of MOST, which won 13 seats in the National Assembly, obviously has this experience in mind when he announced after the election results were made public: “This time, we don’t expect only promises from them [potential coalition partners], but doing it as well. Parliament must be constituted, realise the conditions, and then only will the government be formed” (Milekic 2016a). The most likely coalition will however also need the support from the minority party representatives as they lack the absolute majority, necessary for example to investiture the government (Art. 111 constitution). Byrne, Andrew (2016): Conservative HDZ wins Croatia vote. September 12, in: Financial Times, https://www.ft.com/content/278002c2-7874-11e6-97ae-647294649b28 (accessed September 12, 2016). Milekic, Sven (2016): SDP Leader’s Tirades Leave Croats Bemused. August 30, in: Balkan Insights, http://www.balkaninsight.com/en/article/leftist-leader-tries-antagonizing-croatia-s-elections-campaign-08-29-2016 (accessed September 12, 2016). Milekic, Sven (2016a): HDZ Looks to Form Croatia Govt After Surprise Win. September 12, in: Balkan Insights, http://www.balkaninsight.com/en/article/hdz-wins-on-croatia-elections-promises-government-09-12-2016 (accessed September 13, 2016). Vlahovic, Natko (2016): Opinion. Business-minded PM could transform Croatia. January 25, in: EUobserver, https://euobserver.com/opinion/131967 (accessed September 10, 2016). Karamarko has over the years faced a broad range of accusations but has politically survived everything thus far. Grabar-Kitarović’s own term as president is characterized by partisanship towards the HDZ. Initially Plenković announced that HDZ will not run on the coalition platform. The abbreviations stand for Croatian People’s Party (HNS), the Croatian Peasant Party (HSS) and the Croatian Pensioners’ Party (HSU), see Croatian News Agency (2016). This entry was posted in Croatia, Europe and tagged early election, no-confidence vote, parliamentary elections on September 15, 2016 by Anna Fruhstorfer. 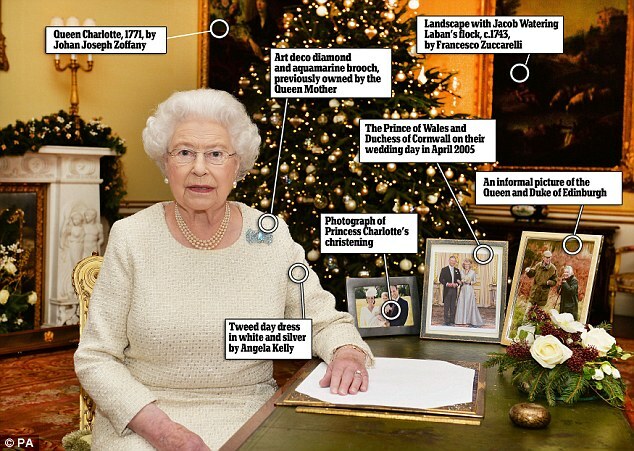 This entry was posted in Austria, Bulgaria, Croatia, Cyprus, Czech Republic, Estonia, Europe, Finland, France, Germany, Greece, Hungary, Iceland, Ireland, Italy, Latvia, Lithuania, Malta, Poland, Portugal, Romania, Slovakia, Slovenia, Switzerland and tagged Christmas message, heads of state, inaugural speech, new year's address, presidential speech, presidential speeches on January 5, 2015 by Philipp Köker. I recently read up on the amendments made to the Czech constitution to allow for popular presidential elections and stumbled across Art. 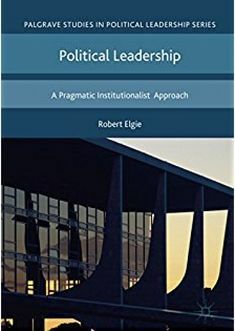 57 (2) – ‘No person may be elected President more than twice in succession’ (which already applied to indirectly elected presidents) and wondered how it looks in other European republics and how it relates to term length. The results of my study of each country’s constitution are summarised in the bar chart below. 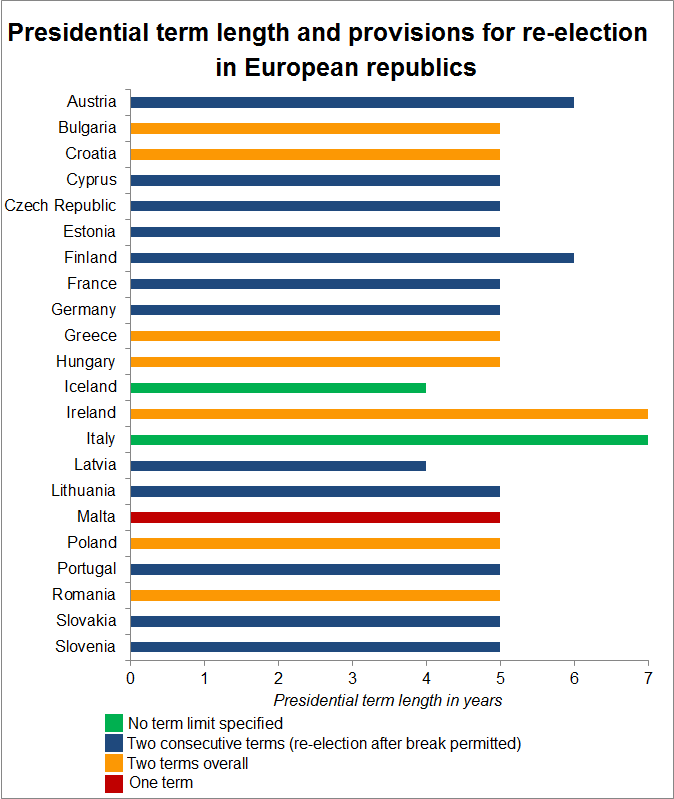 Term length is relatively uniform across European republics – in all but six countries a president’s term is five years. Exceptions can only be found in Iceland and Latvia (4 years), Austria and Finland (6 years), and Italy and Ireland (7 years). Interestingly, all presidents serving terms of six or seven years are popularly elected; yet, so is the president of Iceland who is only serving a four-year term. A limitation to two consecutive terms can be found in twelve out of 22 European republics, i.e. a former president who has already served two consecutive terms could theoretically be re-elected for a further two consecutive terms after ‘taking a break’. In Latvia, the constitution states that an individual may not serve as president longer than eight consecutive years (which equates to two terms in office). In Portugal, the constitution specifies that a president who has already served two consecutive terms can only be re-elected as president after a break of at least five years. In other countries with a limit of two consecutive terms no such provision exists. In seven out of the ten remaining republics, presidents can only be elected for two terms – irrespective of consecutiveness. In Malta, a president can even only be elected for one term (although the constitution is rather imprecise on the subject). In Iceland and Italy, there are no regulations on re-election. While it is the norm in Iceland that presidents serve several terms – since 1944 all presidents have served at least three consecutive terms (the current president Ólafur Ragnar Grímsson is in his fourth term at the moment), Italian president Giorgio Napolitano is the first Italian president to be re-elected. This post first appeared on presidentialactivism.com on 22 August 2013. This entry was posted in Austria, Bulgaria, Croatia, Cyprus, Czech Republic, Estonia, Europe, Finland, France, Germany, Greece, Hungary, Iceland, Ireland, Italy, Latvia, Lithuania, Malta, Poland, Romania, Slovakia, Slovenia and tagged presidential election, presidential term, term of office on August 5, 2014 by Philipp Köker.